From the outset, I’ve been pretty much against Thera. I didn’t particularly see the point in having a wormhole system with four npc stations; the enormous system size, just over 340 AU, seemed unfunctionally large; and I didn’t understand why CCP thought they could dictate what we, the players, would make the next hub. On November 13th, CCP Fozzie released his devblog on Thera, inviting all to come and experience the new system. I had been telling Xander about my concerns and fears of Thera since the o7 episode when it was announced. If we, as EVE players, hadn’t rallied around one wormhole ourselves, why force the issue? It wasn’t until playing around with Thera on SiSi, and spending quite a long time theorizing about the implications, that I understood where EVE was headed. As of right now, it’s pretty easy to stumble upon Thera. Get on the Singularity Test Server (SiSi), join the channel “movemeThera,” and ask CCP to “moveme.” Once complete, you’re unceremoniously dumped in the middle of this sprawling 342 AU system. In fact, to call Thera a huge system doesn’t even begin to describe its vastness. When I poked my head in, there were four non-shattered planets, four stations, and four permanent “lore” sites that spoke to what had happened in the system. Thera is visually impressive; the soft blues and the large planets that the stations orbit are truly a sight to behold and worth the effort visiting. 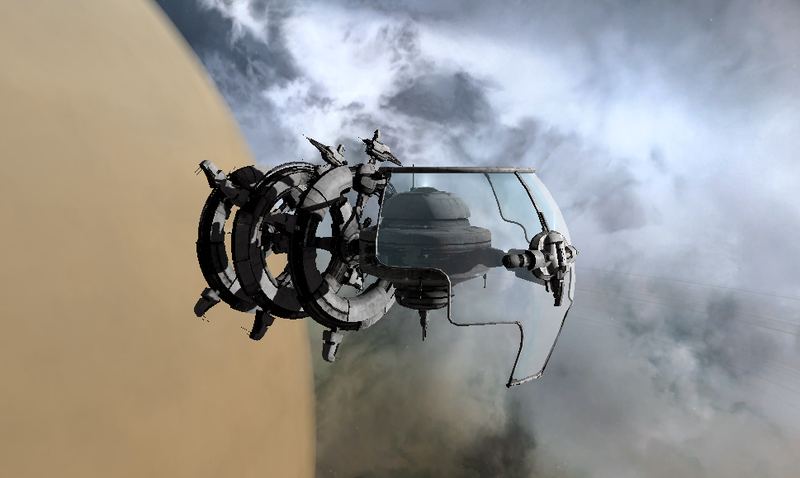 I highly commend the art team on the direction that they took in making Thera unlike any other system in EVE. It truly felt like a new type of space, as Fozzie suggested it would be. There are four Sanctuary stations; two are immediate kickout stations, while the other two have about a 20 kilometer dock radius, and can generally be considered “safe.” On SiSi, most of the activity was occurring around the dual stations at Planet XII. Why these two, over the other two stations, were picked, I’m not sure. It could have been that they were just the two closest to the sun, at 144AU away, but there was nothing particularly special about them. It will be interesting to see if this trend continues when Thera arrives on Tranquility, or if this is just a SiSi peculiarity. For anyone attempting to have a ‘safe’ trip into Thera, I highly recommend the more “tubular” shaped stations to base out of, as those are the non-kick-out ones. From everything I could tell, the four lore sites are permanent, and are the only signatures that don’t need to be scanned down. Each site had a small Sleeper presence at it, though what their purpose is, I didn’t delve into. Best to leave that for when it’s on Tranquility. Besides Thera being the focal point of the latest EVE lore, there is another, less talked about usage of the new system. CCP Fozzie initially called Thera the Jita of pirates, and the Mos Eisley of EVE, but I think that’s a misrepresentation of it’s potential. Jita, or what people call Jita, has always been a place where people go and sit. However, in reality, there is one location of note, Jita IV – Moon 4 – Caldari Navy Assembly Plant, that is the actual focal point for all travel. Mos Eisley, similarly, is a central spaceport, where “You will never find a more wretched hive of scum and villainy.” However, for those who know their Star Wars, the rest of Tatooine, where Mos Eisley is located, is far from the brightest spot in the universe. This is where Thera shows itself to be truly unique. Instead of being focused around a singular station in a system, Thera is a living nexus, connected at all times to every part of k-space. It would be better to describe the system as Grand Central Terminal, or a major international airport. The near limitless connections that can be formed through wormholes allow easy shortcuts through k-space. The stations aren’t there to house permanent residents, though they most certainly will; they’re there to provide momentary rest-stop as pilots take follow the wormhole superhighways between various parts of the map. While capital force projection was reduced by jump fatigue with Phoebe, Thera will give subcapital forces the ability to take significant shortcuts with little to no repercussions, even if it isn’t exactly point-to-point connectivity. In fact, with the changes that came with the Hyperion expansion, there is even larger advantage to using wormholes over gates. Unlike in k-space, where pipe-bombing is still possible (though less likely now with fatigue) and stealth bombers are the scourge of shield BS fleets, Thera is immune from all that. With the Hyperion patch, safety is pretty much assured. Fleets no longer appear clumped together 5km from the worm hole. Instead, they now are spread over a larger area, making bombing runs less dangerous. The lack of anchorable bubbles in Thera also means that the outbound wormhole will be relatively safe to warp to. The length of a warp for a battleship fleet would mean that most dictor bubbles would decay before the fleet ever landed. These benefits to unhindered travel, among other things, are what has me very disappointed at Thera. The travel times between wormholes, and stations to wormholes, makes dictor bubbles mostly useless. Scanning down sites takes forever. Finding another person in Thera becomes a game of chance. The stations vastly favor the attacker than the one trying to undock. And finally, the whole system seems barren. For anyone who has lived in a C4, or has ventured into the less travelled/lived in spaces in high sec, you’ll know what it’s like to come across 13 to 14 signatures in space. Typically it takes two, maybe three minutes of scanning to hit all the sites. With Thera, this process is significantly slowed down. To send probes from one side of Thera to the other is a thirty second flight time. For finding sites, this delay is annoying; for trying to find pilots to violence, it’s impossible. That’s the biggest shock with Thera. With the space that large, one quickly gets discourages and bored of being in a system that big. You can’t see anything on D-scan and the possibility of another ship anywhere near you is actually fairly remote, unless you’re at a celestial. There were many, myself included, who grew so fed up with scanning down sites, that after the first few, we just stopped. I discovered a few wormholes, but any possibility of a data/relic site, or a connection to one of the new shattered wormholes quickly seemed unattainable. For anyone hoping to live in Thera, pack a lot of patience. The probe flight delays to remote sites are what left me twiddling my thumbs and wondering what other game I should be playing. Trying to find sites that are stacking on top of each other at the sun was even more of maddening. They all seemed to overlap just enough to make pinpointing one a UI nightmare. All attempts to scan down ships were equally useless. By the time the probes make it there, begin to scan, get a hit, and the 2 minute warp, the target ship is already long gone. This is going to infuriate combat pilots to no end, leaving them playing an unwinnable game of whack-a-mole with the wormholes. 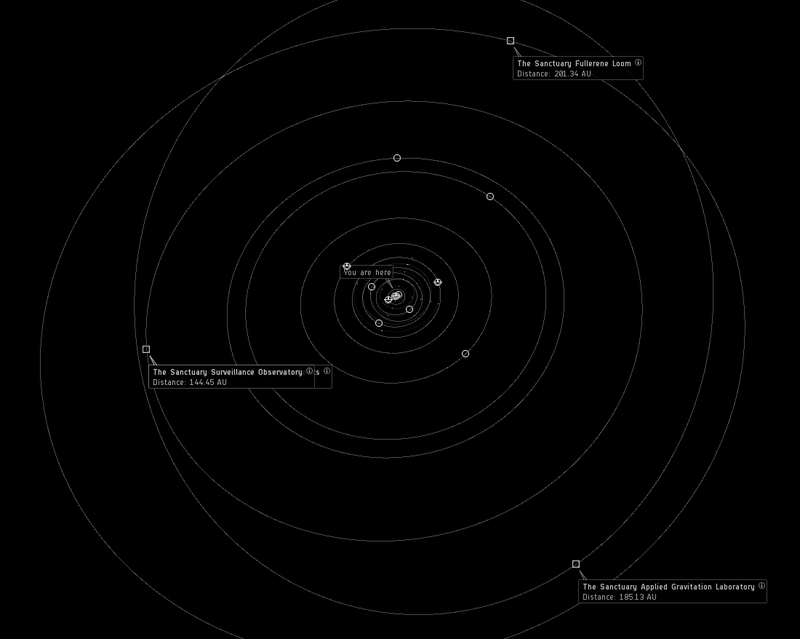 As it stands now, it’s virtually impossible to actively stop anyone from transiting through Thera. But, it doesn’t stop cloaky camps. The immediate meta of Thera will be to quietly sit around all 10+ wormholes and camp them. Any sizeable force, from FW Militias, to low sec pirates, to medium-sized wormhole alliances will be able to regulate travel in and out of Thera. A few hic bubblers and cloaky bombers will ensure that ships can remain tackled long enough for the rest of the fleet to land on grid. Anyone trying to transit into Thera will be forced to jump through k-space, probing each system for another entry, an infuriating process. Despite Thera being impossibly large, it will still be easier to warp the 100AU than it would be to travel five to fifteen to twenty jumps to the next system with the right wormhole entrance. In the event that someone visiting Thera does make it into the system, staying at one of the four stations is the worst choice they can make. While local chat is in delayed mode, anyone docked can see everyone else, giving the people outside the station a distinct advantage. Getting to Thera will be easy, but leaving Thera will be a nightmare. Cloaked hics and dics off the undock will ensure that any escaping pilot doesn’t get a chance, and with a strategically placed alt camping inside the station, the aggressors are at an unfair advantage of knowing who and how many ships will be exiting into the shark infested waters. This balance makes controlling the space of Thera extremely easy, and again favors the large n+1 alliances that span all timezones. With luck, many of my fears will be dissipate by the time Thera arrives with the Rhea expansion. There is still plenty of time for CCP to tweak the rules of this new space and improve the quality of life. As more and more comes out about Rhea, CCP’s hand starts to tip ever forward, giving people a taste of what is coming in the long-term. With Thera I think we start to see how the future of travel across New Eden will occur.